Chant's Path began as the eastern end of Addlewell Lane and appears on Watt’s map of 1806 at which time it was the only road skirting the southern flanks of Penn Hill. At this time neither Park Street nor Penn Hill had been laid out. Addlewell Lane originally started not at South Street, almost as it does today, but was only named as such after the spur running east which today is the road running past the Gate Way and leading to the old ski slope. From his spur to South Street it was called Frogg Street. However, instead of terminating southeast of Penn Hill, it continued west and followed the route of today's Aldondale Gardens, then following the route of the later Chant's Path to join Hendford to the north of the present Brunswick Street junction with Hendford. One of the main problems with this road was the very steep gradient between the section later replace by Aldondale Gardens and the very much higher section later to become Chant's Path. 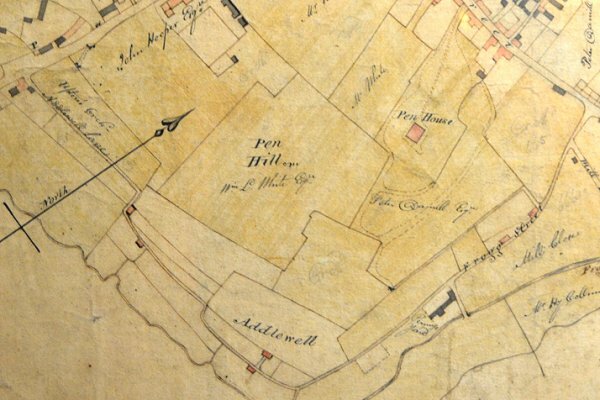 In the 1820's Peter Daniell, who lived in Penn House, built Park Street / Belmont / Brunswick Street and Bidder's map of 1843 shows Addlewell Lane simply petering out. 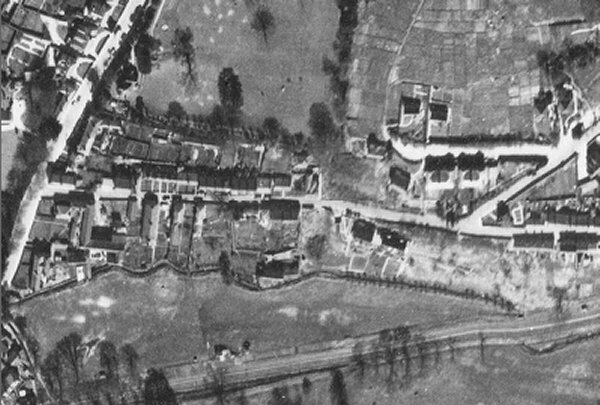 The section that would later become Aldondale Gardens, being steep and with no houses, disappeared while the upper section, cut off by its lofty elevation, became Chant's Path - apparently named after a local builder called Chant (although there were none listed in Yeovil in the 1841 census) who built the Wilts & Dorset Bank in High Street in 1852. The Town Commissioner's Minute Book entry for 27 December 1830 noted "Ordered that a lamp be placed in the Lane from Hendford to Addlewell called Chant's Path near Mr Rowsell's house...." and on 18 January 1831 the Minute Book entry states "Ordered that the Surveyor do forthwith clean and repair Addlewell Lane". The entry for 7 August 1832 reads "Ordered that the Gutter in Addlewell Lane be Turned into the common sewer in Backstreet" (today's South Street). Initially, as seen on Madeley's map of about 1835 below, there were no buildings in Chant's Path however Bidder's map of 1843 shows several buildings. At its junction with Hendford new buildings gradually reduced its width to that of a narrow track or path while at its junction with Brunswick Street it was approached by a flight of steps known as Chant's Steps which, albeit replaced, remained until the 1960s. Just a couple of steps remain today to mark its location. Chant's Path was named as such in the 1841 census at which time nine families, a total of 53 people lived there. By far the majority were employed in the glove trade. By 1851 this had increased to ten families totalling 56 people and again the majority were in the gloving trade. Twelve families comprising 53 people were resident in 1861 although some different trades were beginning to appear such as railway policemen, gardener, house painter and a couple of printers. By 1871 glovers were in quite a minority and by 1881 there was only one glover. 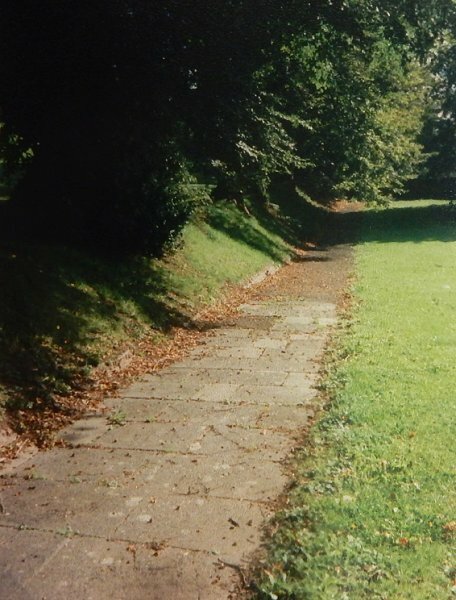 Chant's Path was demolished in the late 1960s / early 1970s and the entrance from Hendford was obliterated by road-works in 1975. Its location is now along the top of the grassy bank facing Brunswick Street opposite the entrance to Goldenstones. 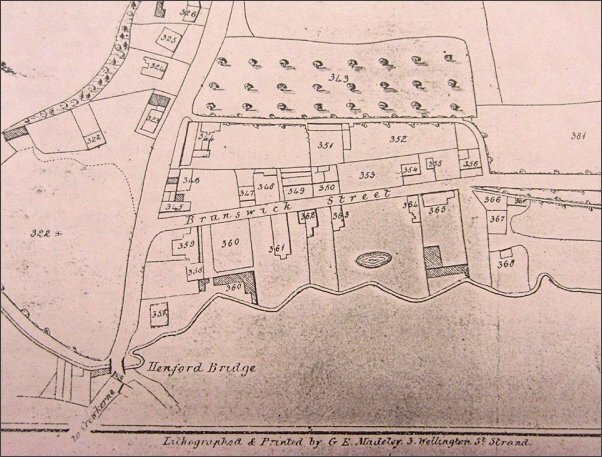 E Watts' map of 1806 showing Addlewell Lane joining Hendford at top left and South Street at top right. The western or left section was later called Chant's Path. After the construction of Brunswick Street / Park Street in the 1830s this section of Addlewell Lane was effectively cut off. 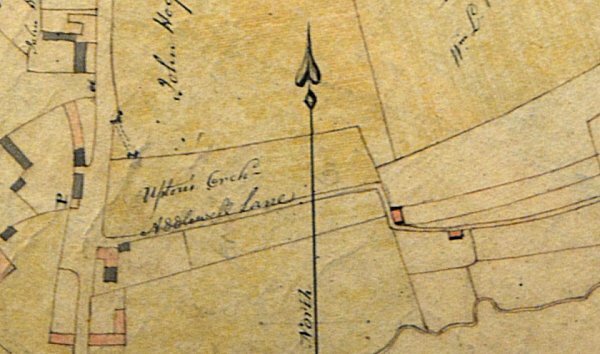 An enlargement of the above 1806 map showing the section of Addlewell Lane that would later become Chant's Path joining Hendford at left. A map printed by GE Madeley of London dating to 1831. By this time Brunswick Street had been built and several houses constructed along it. Chant's Path, however, was still all but devoid of buildings at this time. 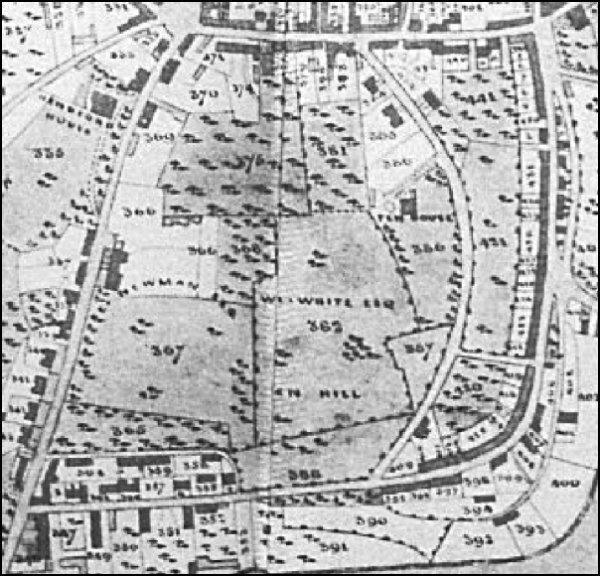 Bidder's map of 1843 shows Addlewell Lane petering out, its importance replaced by the newly-built Park Street. Chant's Path, although not named, is clearly seen now to the north of the new road. The Hendford end of Chants Path. 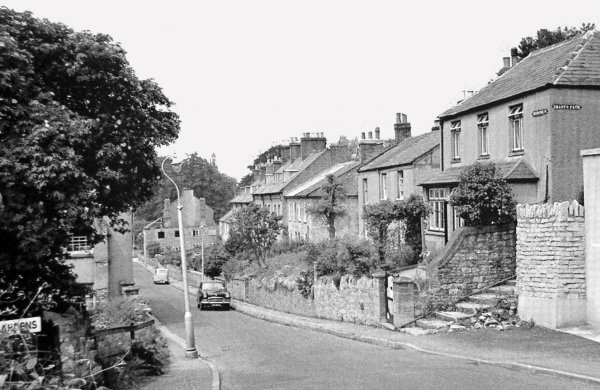 This view, again from the early 1960s looks down Brunswick Street to the junction with Hendford, seen from the entrance to Aldondale Gardens at bottom left. The steps at bottom right, known as Chant's Steps, are the the south-eastern end of Chant's Path, its street nameplate on the end wall of the house at right. The steps indicate how steep this section of Addlewell Lane must have been before Brunswick Street was built. 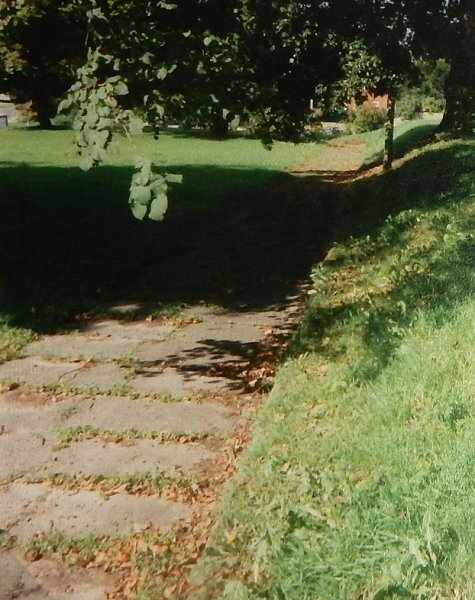 The route of Chant's Path, photographed in 1997. .... and looking in the other direction, again photographed in 1997.